The installation of your Mitsubishi Electric system guarantees high yields and significant energy savings. Contact us to book an appointment at our headquarters in Milan or for a free inspection at your home, in Milan and province. AirClima has been recognized for several years as IQP Mitsubishi Electric qualified installator: a certificate of quality, reliability and security that enables us to be officially recognized, in Milan and throughout the national territory, as Qualified Installer Partner for installation of Mitsubishi Electric air conditioners and air conditioning systems. 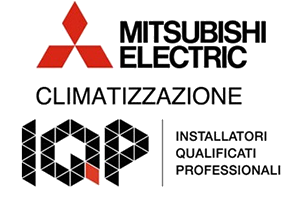 Today we are one of the historical and most dynamic service center (authorized by Mitsubishi Electric) in all Milan and near districts, a characteristic that makes us proud to always show you a great professionalism, flexibility and product knowledge. In the execution of our installation service of air conditioners in Milan, we use exclusively high quality products and materials, paying the utmost attention to every single detail, in order to guarantee in all circumstances an execution of the work in a workmanlike manner, able to meet every need. For every kind of installation in residential/domestic and commercial/industrial field, our team of professional technicians will always be able to find the right solution. All our air conditioners only use ecological gas and they are the highest quality products and in A, A +, A ++, A +++ energy classes, thus with particularly low electrical input and capable of ensuring unprecedented energy savings. Quietness, reliability and respect for the environment (avoiding everything that can damage the ozone) are among the characteristics that guide our proposals for the installation of air conditioners. Contact us or book an appointment now at our headquarter or a free inspection: together, we will solve every climate need (for residential or commercial use) for the cooling, heating, dehumidification and the purification of your home, of your store, your office or company. Fill out all fields and please not forget to include in the notes your address and phone number.